Most of the people, when fought with some unfavourable circumstances, life-shaking loss in individual or professional life, thinks they are finished, and its end. Under such condition, we may depressed and think now it’s over and out but let us remember lifelong quarrel of ‘is the glass half full or half empty? If you are realist person, the glass is not half but completely empty, it is utterly sure that you are defeated, depressed and out, end of everything in your life. But, if you are dreamer person the glass is not half but completely full, because you have lost everything so, there is nothing more to lose. Now you can start from scratch, improve all the blunders you have perpetrated in past, begin with great motivation and passion, wipe out all the bad memory of past from your mind, erase all the setbacks from your mind’s hard disk and begin again with an empty box. One thing is quite clear, past has gone, either you can remember & regret it or you can go back and start a new beginning and make a new ending. The selection is yours, time is running, every minute is valuable, no matter how many days are left in your life, but you can start today and make a new ending. We hope guys you find Quote "There will come a time when you believe everything is finished. 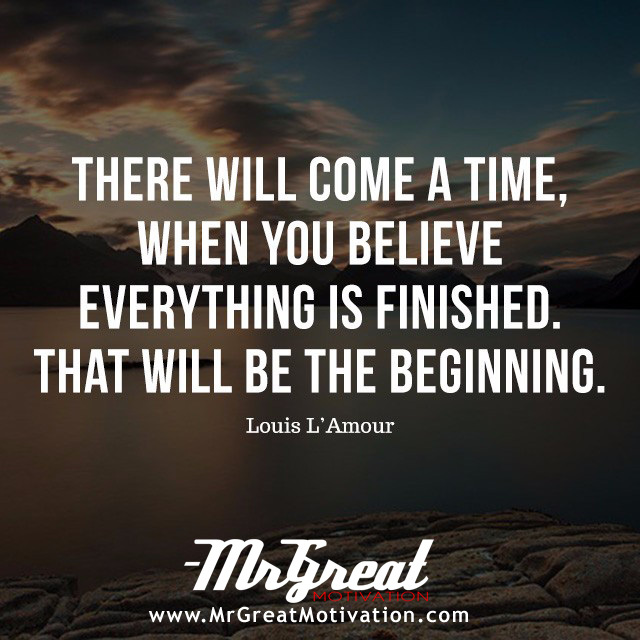 Yet that will be the beginning - Louis L'Amour" by Mr Great Motivations useful. If you think we have made some efforts, then don't forgot to appreciate us by sharing this Quote with your friends and family, And thanks for visiting.